The C-o-C, who must be obeyed, has deemed that this edition ought to be a “special” to give you a more comprehensive flavour than heretofore of what is in store for you in May. My history teacher in school was nicknamed “Ghandi”, courtesy of his physiognomy rather than any pacifistic tendencies. He didn’t instill in me a lasting love of the subject – rather a fleeting flirtation. This will become all too apparent as you struggle through the historical references* in what follows. (*mostly garbled plagiarisms from the interweb) Whatever, here goes. Your odyssey begins in Castlemartyr, though I suspect that there will be some unforeseen episodes to be enjoyed/endured as you make your way to County Cork. 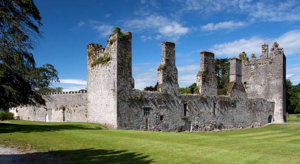 The castle from which the village of Castlemartyr takes its name was first built in 1210 by The Knights Templar, who were one of the most famous of the Christian military orders under the leadership of Richard Earl de Clare, more commonly known as Strongbow. In the centuries that followed, the lands changed hands many times, among its owners were Sir Walter Raleigh and Richard Boyle, the first Earl of Cork. It was under Boyle’s stewardship that the construction of the magnificent Manor House took place in the 17th century. Painstakingly restored to its original grandeur, the Manor House now forms the centerpiece of the Castlemartyr Resort. Other historical features include the unique Templar Cross, which composes the centerpiece of the Castlemartyr’s Golf Club coat of arms. Following a rebellion in 1578, the Earl of Desmond James Fitzgerald had his estates forfeited to the Crown and awarded to Sir Walter Raleigh. In the more recent past, while on tour in Ireland in 1965, the Rolling Stones passed through the village on their way to play the Savoy Theatre in Cork. While Bill Wyman and Charlie Watts took tea at Mrs. Farrell’s eating house, Mick Jagger, Keith Richards and Brian Jones had a drink across the street at Barry’s Bar. 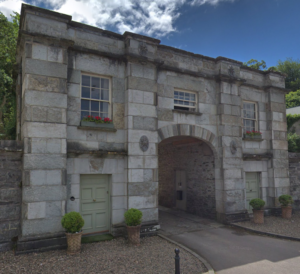 When you leave the “Resort” on Day 1, Sunday afternoon you will be connecting to the 2018 Shamrock with a visit (test and refreshments) to the Jameson girls’ Tourin House & Gardens after your first regularity takes you north along an interesting selection of roads west of the River Blackwater. Then it is across the river to David Keane’s orchard for a testing trip between the trees. 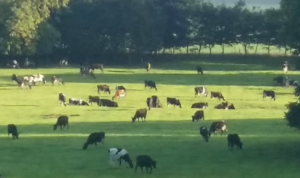 Another test follows at Moorehill where Shane Maxwell runs an up-to-the-minute grass-based dairy operation. I suspect that the route will not take you through any milking parlours. On the way here, you will have passed the magnificent Lismore Castle – well worth a visit if you can wangle one. I have managed to get in. 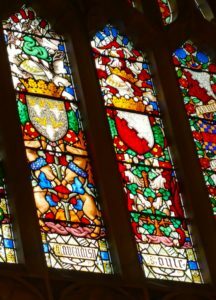 The Great Hall’s stained glass windows stood out for me – in particular this pair of windows, two adjacent panes of which caught my eye. They featured Robert Boyle of Boyle’s Law fame and, maybe less well known, William Cavendish, the seventh Duke of Devonshire, who was the Chancellor of Cambridge University in the early 1850s. It was he who was responsible for the setting up of the famous Cavendish Laboratory. To get home to Castlemartyr you will have a Marked (by yourself, courtesy of some instructions) Map. You will be skirting Ballynatray which was also on last year’s itinerary. Also, the village of Mount Uniacke. The Uniacke family lived here in the 18th and 19th centuries. 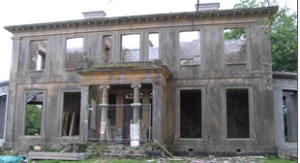 One of their houses, Castletown, occupied by three generations of Norman Uniacke, is not in great shape. In the mid 19th century the house was valued at £30. It was burnt in 1921 during a period when the Protestant “Ascendancy”was being beleaguered and it is no longer extant. On arrival in Castlemartyr, there will be another test of both your metal and mettle. Day 2 will begin with a rearranged reprise of the previous evening’s test before you head north for the Ballymonteen regularity which starts in what appears, on approach, to be the “middle of nowhere”. The impressive dual-carrigewayed entrance on the left is certainly a surprise. The photo reveals what is at the end of the driveway. The label on the premises is “Irish Distillers”. It is a maturation plant where whiskeys bide their time to achieve the quality which discerning tipplers like yourselves expect. The rectangles are warehouses, each surrounded by a bund so as to minimise losses in the event of a mishap – alcoholic accidents can be arresting. An uneventful run avoiding the relatively new M8 will bring you to Watergrasshill Kart World. More time than you might have expected has been allowed for this visit to give you an opportunity to study each others’ flair for persuading your steeds to adapt to an environment alien to their raison-d’êtres. On the far side of Watergrasshill the Bride’s Bridge regularity will bring you north into the foothills of the “Nagles Mountains”. Don’t let the “Bridge” in the regularity name lull you into a sense of false security – a periscope might be useful for one of the crossings of the River Bride. You will pass through Carrignavar after you finish the regularity. You might catch a glimpse of the local castle. This was built by one of the McCarthy/ Muskerry dynasty. You are on your way to a rather grander McCarthy/Muskerry residence – Blarney Castle. This is one of the most popular tourist attractions in Ireland. Its USP (“unique selling point” for those unfamiliar with the increasingly bewildering array of acronyms/abbreviations we are bombarded with daily, e.g. 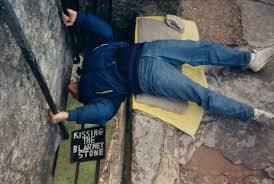 YSYL – “answer” at end of the Day 2 spiel) is the Blarney Stone which has to be kissed from a precarious position. I don’t think you will get the opportunity to do this but you will be fed and there will be a test. The number of visitors to the House and Gardens means that we have to be circumspect with our running of the test. The visitors tend to wander hither & thither and need to be treated as an endangered species. An eight mile run brings us to Dripsey for the first of the aftenoon’s regularities. The village has an idiosyncratic “claim to fame” which is its entry in the Guinness Book of World Records for having the shortest St. Patricks Day Parade in the World – just 26 yards.This “shortest” St. Patrick’s Day parade went from one door to the next of the village’s two pubs, The Weigh Inn and The Lee Valley. It held the record for nine years (1999-2007) until the closure of The Lee Valley Inn. Heading west you will end up on the outskirts of Macroom. From 1976 to 1982 Macroom hosted the annual Mountain Dew festival, organised by young local business people. The festivals attracted up to 20,000 attendees each year. It was the first of its kind for Ireland, and was intended to reinvigorate a town that was then stagnant economically. According to one of the organisers, Martin Fitzgerald, “the town needed a bit of “shake, rattle and roll” to tempt, not just international investors, but Irish people to rest there a bit longer – a rock concert fitted the bill”. Line-ups included Rory Gallagher, Phil Lynott, Elvis Costello, Van Morrison, Marianne Faithfull and Horslips. Just before the next regularity (Lough Allua) you will arrive in Inchigeelagh. The River Lee, which flows into the sea at Cork City passes through the village. The nearby ‘pater noster’ string of lakes collectively known as Lough Allua were once popular with anglers and are now fished for large pike, perch and some brown trout. The decline of fishing and, along with it, the fortunes of the village as a location for angling, has coincided with the loss of salmon on the River Lee. This is alleged to be a consequence of the erection of hydroelectric dams down-river between 1952 and 1957. This regularity will feature the first mountains of note. Having continued west into the Gaeltacht (the term for those regions in the country where you will find significant numbers of folk who can converse in Irish) to Ballingeary, you then head north into the Sheehy Mountains and along the route of the Fuhiry Circuit of Ireland Special Stage, to the Top of Coom – the highest pub in Ireland. (One of many to claim thus!) The link below is for a video, which was made after a refurbishment in 2014. There will be a refreshment opportunity here, after which there will be a forestry test down the road. From there it will be down along the southern bank of the Roughty River to the Kenmare road. You will follow this through Kilgarvan. This village is most notable for its pair of politicians, Michael and Danny Healy-Rae, both of whom are extremely “colourful” TDs (members of the National Parliament). Danny recently suggested that the climate change narrative was as credible as the story of Noah’s Ark. Their father was Jackie. In jig time, you will have arrived in Sheen Falls Lodge. YSYL – You Snooze, You Lose. We have a nice, gentle start to Day 3 as we head for Bantry on the main road which mirrors the meanderings of the River Sheen until Gortnagappul, where we turn off and start climbing towards the Priests Leap, Irelands highest mountain pass at 1500 ft, from Bonane in Co. Kerry to Coomhola in Co. Cork. 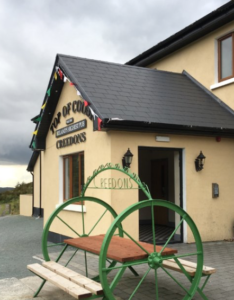 According to local tradition, the name stems from an old legend, in which a priest, pursued by soldiers, escaped by a miraculous leap of his horse from a mountain cliff in the townland of Cummeenshrule in Co. Kerry into the townland of Killabunane in Co. Cork. Not long after passing to the west of Coomhola Mountain, you will start your first regularity. This will be a zig-zag affair, via Pierson’s Bridge, around the hinterland of Ballylickey before it finishes on the outskirts of Bantry. 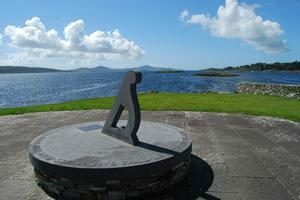 Going around Bantry and climbing again will bring you to an al fresco coffee stop in the Captain Francis O’Neill Memorial carpark before you start the Inchybegga regularity. Inchybegga’s claim to fame is its prehistoric Five Stone Circle. Francis O’Neill is more interesting. Always referred to locally as The Chief, he was a West Cork hero who championed Irish traditional music. He was born in 1848 at Tralibane. His parents had a very strong background in Irish music. Like so many of his peers he left home at the age of 16, embarking in Cork city on a sailing vessel bound for England and from there found work on other ships which took him around the world. Among his many adventures was a shipwreck while aboard the Minnehaha in the South Pacific. He was rescued by a passing ship which eventually docked in San Francisco, where he decided for the time being to stay on dry land. His journeyings took him on to Chicago, where he joined the Police Force in 1873. 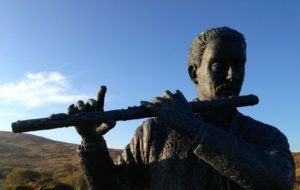 At that time 40,000 residents of the city were Irish: by 1900 there were over a quarter of a million there: a huge reservoir of Irish music for Francis to garner – something he revelled in. All through his adult life he collected and wrote down tunes. 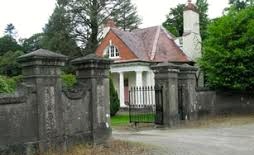 The regularity finishes just north of Skibberreen at Hollybrook House where Morgan Teige Gerald The O’Donovan, a solicitor, now lives, with his family. His father, Morgan Gerald Daniel The O’Donovan was chief of one of the leading families of the old Gaelic nobility. Dan’s mother inherited Hollybrook. For the far-flung O’Donovans, it was a historic place to stay. From browsing the internet, they learned some of their ancient origins, and that, even after the fall of the Gaelic order, they were one of the few Irish families of Carbery and Munster still recognised by the English to be of royal extraction. No doubt they even learned The O’Donovan’s name in Irish: Murchadh Gearóid Dónal Ó Donnabháin. Dan’s younger daughter, Mary is married to Francis Chamberlain, grandson of former British prime minister, Neville Chamberlain. Your first test of the day will take place here. Skibberreen is celebrated for its local newspaper, the Skibberreen Eagle which signalled its cosmopolitan aspirations. This was typified on 5th September, 1898 when the following editorial appeared: “We will still keep our eye on the Emperor of Russia and on all such despotic enemies, whether at home or abroad, of human progression and man’s natural rights.” The Skibbereen Eagle is no longer with us, but Russia is, and the eyes of the world are still firmly fixed upon it. 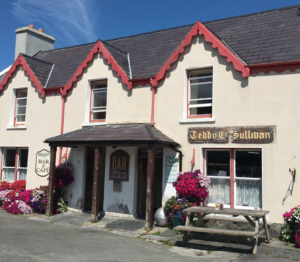 Next, it’s off to Paul & Georgiana Keane’s fabulous Inish Beg for lunch and another test. 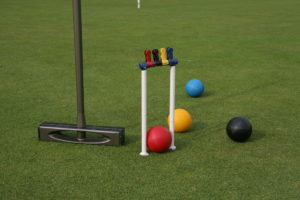 A notterribly- obvious-to-the-untrained-eye feature here is an international-standard croquet lawn. I understand that this is a pretty cut-throat “game” so I suspect it would appeal to many of our competitors! Unfortunately, there won’t be time to wield any mallets. On a more historical note, Kay Summersby, who served as chauffeur and personal assistant for General Eisenhower while he was Supreme Commander of the Allied Expeditionary Force in London, was born at Inish Beg house in 1908. There was a scurrilous suggestion that the relationship might have been closer than the public were led to believe. After this, it’s back the way we came for a bit, then along the N71 to Ballydehob and on to the Mt. Gabriel regularity which starts just short of Schull. Mt. Gabriel is 407m high. From the summit there are views south over Schull Harbour and Long Island Bay. To the east and southeast, the views take in Roaring Water Bay and its many islands, popularly known as Carbery’s Hundred Isles (not a salad dressing). North and west is a view of the mountains of the Beara Peninsula and South Kerry. The Fastnet Rock is situated approximately 18 km to the South, and is visible in fine weather. The village of Durrus separates the end of this challenge and the beginning of the next one – The Goat’s Path regularity. This explores a selection of byways on the Sheep’s Head peninsula. I hope that no other farmyard animals will impinge on your endeavours. The Goat’s Path would seem to be somewhat nebulous and is used to describe any, or all, routes from Skibberreen to Bantry via Ahakista. This regularity certainly uses many of the roads defined thus. It is worth noting that no matter on which of these you choose to travel, you will not be disappointed from a scenic point of view. Discernment will be required if you wish to minimise penalties. If you fancy yourself as a celebrity spotter keep an eye out for BBC chatshow host (and author), Graham Norton who has a home in Ahakista. On a more sombre note, also in Ahakista is a memorial garden and sundial that honour the memory of the victims of the 1985 Air India disaster. The Boeing 747 was blown up by a bomb at an altitude of 9,400 m and crashed into the Atlantic Ocean, while in Irish airspace, with the loss of all 329 people on board. After the regularity, there is a relaxed run along the northern side of the peninsula to Bantry House for a test and some refreshments. Originally built in the early 18th century, Bantry House has been owned and occupied by the White family (formerly Earls of Bantry) since the mid-18th century. Opened to the public since the 1940s, the house, estate and gardens are a popular tourist destination. You will be using the new entrance on arrival but will depart via this more interesting gate. 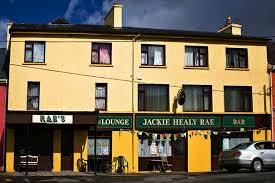 Taking the main road north from Bantry, you will pass through Ballylickey before heading for the hills once more. This time you will have the opportunity to enjoy another former Circuit of Ireland Special Stage – Borlin. There will be a test at Letter Lower just five miles before you arrive back at Sheen Falls. The Beara peninsula will be your playground for Day 4. A heartwarming drive over the Caha Mountains will bring you to Glengariff. Remind yourself of the location of your headlights switch before you set off. Battle will commence on the Trafask regularity south of Glengariff. This finishes as you approach Adrigole, which is at the beginning of what should be one of the highlights of your May meanderings – yet another Circuit of Ireland stage, the Healy Pass. This was built in 1847 to provide employment during the famine years. It’s named for Tim Healy, a politician from Cork, who served as the first governor general of the Irish Free State. Upon his retirement, Healy asked that the bridleway winding through the pass be upgraded and improved. This request was complied with and the road continues to be in good shape. At the bottom of the other side is Lauragh and, soon after that, your first test of the day in Derreen House & Gardens. The land around Derreen came into the ownership of the Fitzmaurice family in 1657 through Sir William Petty, physician and surveyor to Oliver Cromwell. Petty’s daughter married The Earl of Kerry whose family later became Lansdowne. Until 1856 the house was let to the McFinnan Duffs, chiefs of the local O’Sullivan clan. When the fifth Marquess of Lansdowne succeeded in 1856 he was drawn to the place and decided to make Derreen his summer home. Today the house belongs to his descendants. The garden has been constantly looked after and improved since the 1870’s making it one of the most established gardens in Ireland. One of its quirky features is the community of Derreenies. 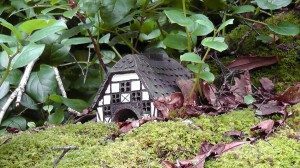 They are about 2 inches tall but are much rarer than fairies. 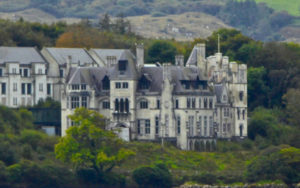 They have only ever been seen on the Derreen Estate. The last sighting of a Derreeny was in 1855. In 2012 some clearing was done along the walks and 20 very small houses, like the one pictured, were discovered. All the houses are vacant but look like they have recently been lived in. Children in the garden have reported hearing movements in the rhododendrons as they walk along the paths. Eyeries and the Eagle Hill regularity beckon 20 minutes “up the road”. Eyeries was the location for the shooting of the film The Purple Taxi (1977) starring Fred Astaire, Peter Ustinov & Charlotte Rampling and also the 1998 TV series Falling for a Dancer, a dramatisation of life and love in 1930s Ireland based on the novel by Deirdre Purcell. The regularity involves another traverse of the peninsula across the Slieve Miskish Mountains ending in Castletownbere for another test and some lunch. A “different” detail of the town’s history is that the US Navy established a naval air station there in April 1918 to operate a Lighter- Than-Air (LTA) Kite Balloon base during World War I. The base’s usefulness was short-lived as it closed shortly after the First Armistice at Compiègne. Your post-prandial regularity starts at the unprepossessing entrance to Dunboy Castle. The castle has been in ruins since the 1600s but there was an adjacent manor called Puxley Mansion. This had fallen into disrepair. In 1999 a consortium acquired the Dunboy Estate, planning to establish a luxury hotel in the grounds. Work eventually got going but it was never quite finished and plans to open “Dunboy Castle” in the summer of 2009 failed to materialise. Work on the project was suspended in January 2010. And so it remains, almost there, as pictured below. The regularity is named “Allihies”. From the Bronze Age the Allihies had been a site of coppermining. In 1812 John Lavallin Puxley, the same family as mentioned above, established a company to operate the Berehaven copper mines at Allihies. During the following 100 years, 297,000 tons of ore were recorded as passing through the smelter at Swansea in Wales from the mines at Allihies. Three ruined Cornish engine houses are visible from Allihies. The most Shamrock Vintage Challenge 2019 visually prominent is the Mountain Mine main engine house, located on the skyline above the village. You will be passing through more mining territory as you make your way to Eyeries for the final regularity. This will take you on a coastal loop to Ardgroom, which you visited already today. More step retracing – it is amazing how different the view is when you are travelling in the opposite direction not to mention the sun/earth (it will be shining throughout the event) having changed relative positions – to Derreen which we pass by en route to the final test in Bunaw. There will be refreshments there to fortify you for your drive back to the Sheen Falls.